Key Difference: Casting the screen is very popular right now. It basically allows one to play content from one device to another, for example playing a movie from a phone or a table onto a TV. This allows one to watch shows, movies and other content on the big screen. Screen mirroring is exactly what it sounds like; it allows one to mirror their screen display. It connects two devices together and one screen is copied onto the other. Technology can be tricky at times, especially for someone who is not attuned to that knowledge. There are so many factors that are at play in technology that by the time one gets a handle on it, something newer and better has come along, and one has to start all the way at the beginning again. One such thing is video streaming. Video streaming allows one to watch what they want, when they want. Hence, it has gotten really popular as an option against traditional cable. However, it gets tiresome to watch content on a phone or a tablet, hence, people really want to watch that content on a larger screen such as a TV or a projector. One option to do this is to buy a Smart TV, which can be quite expensive. Another option is to use a video streaming device such as Chromecast which supports Cast Screen and Screen Mirroring. 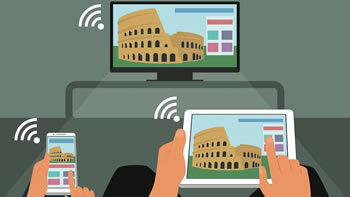 One can use Miracast or Chromecast to cast and mirror apps and screens. The primary way to cast or mirror the screen is to use Miracast, however, in cases of devices that do not support Miracast, there are other devices available on the market such as Chromecast and others that allow one to cast or mirror their screen. Casting the screen is very popular right now. It basically allows one to play content from one device to another, for example playing a movie from a phone or a table onto a TV. This allows one to watch shows, movies and other content on the big screen. Many popular streaming devices such as Netflix, Hulu, Google Music and Movies support screen cast for exactly this reason. However, there are many apps that so not support cast screen, and this is where screen mirroring comes in. Screen mirroring is exactly what it sounds like; it allows one to mirror their screen display. It connects two devices together and one screen is copied onto the other. It shows everything that goes on one screen onto the other. Screen mirroring it especially useful when an app does not support cast screen, as screen mirroring needs no individual support from the app. 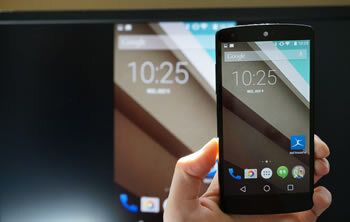 As long as the phone supports screen mirroring it will display everything on the screen, regardless of the app. Screen Mirroring is also beneficial to view local content such as personal photos, videos, etc. As most apps do not support local content, screen mirroring does not have that issue. For example, when one has friends over and want to show them the photos from their recent trip, instead of passing the phone around and everyone seeing them one at a time, they can put them up on the TV via screen mirroring and everyone can see them together. However, one limitation to screen mirroring is that it shows everything that is going on one screen to the other; this includes the settings, the home, etc. Additionally if the phone or table times out and the screen goes blank while still connected to the TV, the same thing will happen to the TV. Hence, in screen mirroring the phone screen needs to be constantly on, which drains the battery of the phone. Cast screen does not have this issue. One the content has been cast, the phone can be used to go something else, such as check messages, scroll social media, take a call, or even leave the room, all the while the content will continue to play on the TV unhindered. So, each has its own benefits and limitations. While cast screen is better in the sense that it allows one to multi-task, it is also limited in the sense that not apps support cast screen. This is not a problem with screen mirroring, as if the phone can do it, it will show it as is on the TV. Still, its limitation is that it restricts the phone from doing anything else other than mirror the screen. Supports local content such as person photos and videos.